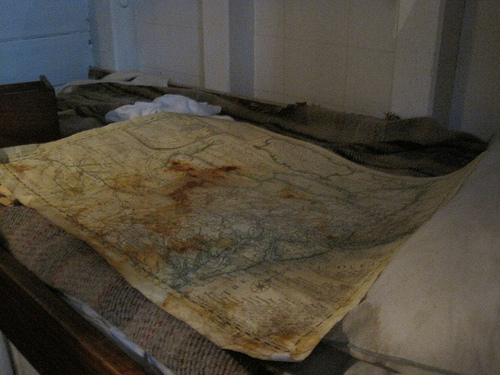 The map, they said when they sold it to us, was found tucked in the threadbare jacket of a skeleton in a jewel-strewn cave but the general consensus amongst the crew is that this is likely an exaggeration if not an outright lie because it is quite a large map, too large to be tucked anywhere. When we unroll it for consultation we spread it out on beds or on the deck because it takes up too much room on the tables. At first we could not make heads or tails of it as the compass inscribed in the corner has directions that do not correlate with familiar east or west, and the coastlines and the islands seem to change with the wind direction or on unspoken whims. There are many places marked with X’s or circles but none are clearly identified as treasure. None of them are clearly identified at all, most of the text on the map is written in obscure languages or too faded to read. Our navigator makes little checkmarks next to places as we visit them. Sometimes he draws little pictures of the things we found there or transcribes recipes for native pastries. To mark the quieter locations he paints tiny representations of their particular sunrises. The map is becoming more and more covered in ink and history and coffee stains and still there is no treasure to be found. The talking violet crab we picked up on that island with the beach covered in keys likes to say that perhaps the journey itself is the treasure but he also tells stories about feathered sea monsters, so no one pays him much heed.